You will provide our team with strong support in the design of any digital documents, figures and illustrations (whitepapers, roadmaps, milestones, presentations, etc.). You will be in charge of reaching out and working with other marketing firms. You will be working in areas of community marketing, content marketing, paid advertising, PR marketing, social media marketing, influencer marketing, video marketing, and other various marketing aspects surrounding an ICO process. You have an outstanding degree from a university or university of applied science in a subject such as Business or Economic Science, ideally with a focus on marketing. You have an interest and good knowledge in blockchain, ICO processes and cryptocurrencies. You have already successfully completed a number of company work placements or have completed a professional training in areas of marketing or blockchain. You are able to work under pressure and dedicate yourself to the task in hand. You enjoy working in a team; analytical thinking is only one of your outstanding skills. You have a basic knowledge of finance. You are able to manage professional relationships and you are able to communicate professionally with other parties. You have very good Excel and PowerPoint skills and a very good command of English; an additional Asian language is more than welcomed. In our young corporate culture, you can expect a high degree of responsibility. Personal development and free scope to develop your own ideas. By working on our three desks, you will gather valuable insights into all the different types of transactions, industries and markets. Personal contact with investors and other parties at high management levels ensures fast decision-making and efficient business processes. IEG – Investment Banking Group is a leading, global independent investment banking boutique focused on mid-cap transactions. 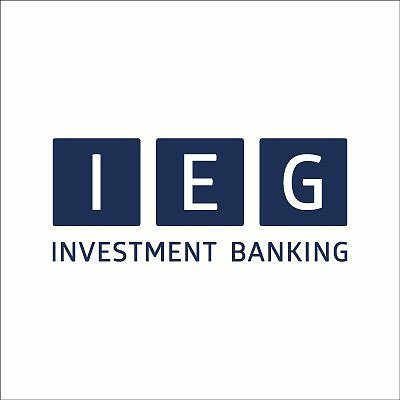 Locally present in the key international growth regions and/or emerging markets, IEG – Investment Banking Group is a unique, influential and trusted partner for growth companies and larger, international corporates for Mergers & Acquisitions, Financing, ICO & Corporate Advisory. Due to the structural focus on all topics related to digitization, our clients benefit from our market know-how in the segments of Internet, Technology and Services and our international network. In the last 12 months, the team of IEG could successfully complete 16 transactions. To continue this growth and to strengthen our team of 85 professionals worldwide, we are looking at expanding our team to include personnel with blockchain knowledge and interest to engage with our clients, 3rd parties and investors.